Orem’s settlement history is somewhat unique in the State of Utah. Although full-time occupation of what was then known as “Provo Bench” did not occur until 1877, the first attempts at settling the Bench occurred in the late 1850s. However, lack of a major water supply prevented this until a small canal was completed that brought water to the parched land in 1864. Soon, more canals were dug and settlers from Provo and Pleasant Grove were planting crops—first alfalfa, then berries, and then fruit trees. The fruit trees particularly thrived and soon orchards and small farms were springing up everywhere. However, few architectural examples remain from this early era of settlement. State Street was a section of the major traffic route to the south and helped the fruit industry early on. However, it was not until a rail line was established through the area that business really thrived. 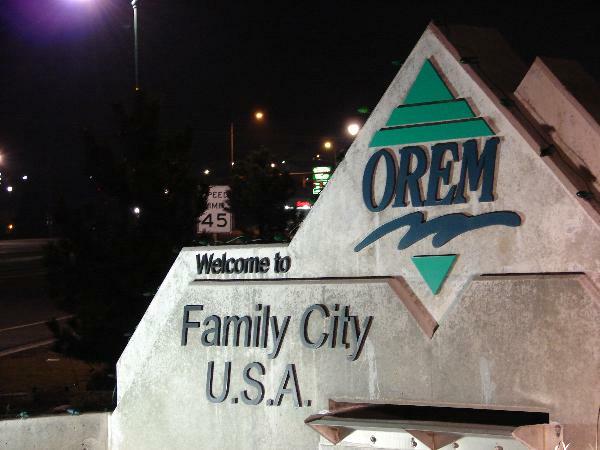 Walter C. Orem owned the company that built the line, and so to honor him “Orem” was chosen for the name of the developing community which incorporated as a town in 1919. During this developing era, small farmhouses constructed in Vernacular Classical and Victorian styles typical of the rest of the state were the norm. Few commercial buildings were constructed as farming was the primary occupation. It would take more than two decades before Orem would become a city in 1941, on the eve of WWII. At about this time the farming community would add an industrial component to its economy with the construction of what would become Geneva Steel. The architectural transition is apparent in the types of buildings, particularly homes that were constructed during this era. Bungalows, which became the house of choice in the late 1910s and 1920s transitioned to period cottages that hinted at historic European styles. However, the leaner times following the Great Depression and lasting up through the War influenced architectural styles. Fewer materials were available so houses were much simpler and cheaper to build. WWII-era cottages were the typical house built during the 1940s and early 1950s. Orem’s only National Register historic district—Christeele Acres—was constructed in 1943 and features typical examples of this type. Following WWII the economy began to pick up again as many returning GIs took jobs at Geneva. Commercial development increased and more substantial commercial buildings were constructed in Orem. Prosperity brought with it larger homes in newer styles that continued to reflect simplicity in their architecture. The ranch house was the vogue choice, and practically the only choice in the 1950s. Ranch subdivisions sprouted up in many areas of Orem during this decade as the population rapidly increased. Many of these neighborhoods are still historically intact and reflect the end of the historic era.